Because a beautiful poem such as this deserves to be read, understood and appreciated. Because Branwell Brontë deserves to be read, understood and appreciated. Because this poem had no place and it deserves much better. Because Branwell Brontë deserves his due. On shadowy scenes will shine. And Branwell Brontë is slowly getting his due. As more and more people come to know and touch his tortured genius through his words. Across the ages, you empathise. A broken man, a man who lived not up to his potential or his dreams. And he came to know that. Perhaps it was a sign of this perception that he should choose paint himself over in the portrait that he painted of his illustrious sisters. 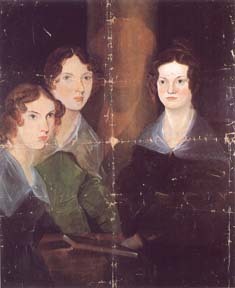 See this famous painting of the Brontë sisters? It was painted by Branwell. See that patch of paint in the painting? That is Branwell painting over what would have been his self-portrait. Erasing himself. But they say the paint is peeling over, and soon maybe the world will see Branwell again. Just one layer of paint. It is a good sign perhaps, that this silent, self-effacing soul will once again see the light of day. If only through his beautiful words. Jai Mata Di! Let’s metal!